Crews comb the beach near the BP Whiting Refinery March 25 to clean up an oil spill in Lake Michigan. Crews comb the beach Tuesdayalong the BP Whiting Refinery to clean up an oil spill. Crews comb the beach Tuesday near the BP Whiting Refinery to clean up an oil spill in Lake Michigan. BP’s Whiting Refinery is seen along the shore of Lake Michigan on Tuesday, March 25, 2014. A malfunction Monday afternoon caused an unknown amount of oil to spill into Lake Michigan. The discharge took place in a cove near the refinery's water treatment plant. In this September 2012 file photo, BP's Whiting Refinery is seen with the Lake Michigan shoreline in the background. A malfunction Monday afternoon caused an unknown amount of oil to spill into Lake Michigan. The discharge took place in a cove near the refinery's water treatment plant. Crews comb the beach Tuesday while cleaning up an oil spill from the BP Whiting Refinery. BP estimated Thursday that between 15 and 39 barrels of oil were released into Lake Michigan on Monday. Crews comb the beach near the BP Whiting Refinery on Tuesday to clean up an oil spill in Lake Michigan. Crews comb the beach March 25 near the BP Whiting Refinery to clean up an oil spill in Lake Michigan. Crews comb the Lake Michigan lakefront on March 27 while cleaning up an oil spill from the BP Whiting Refinery. BP’s Whiting Refinery is seen along the shore of Lake Michigan. The EPA has imposed new standards that further control emissions from refineries. 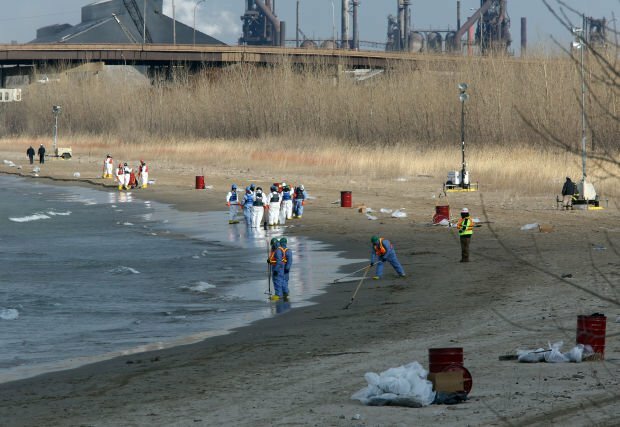 WHITING | Hazmat-suited crews worked Tuesday to clean up an oil spill that spread across 5,000 square feet of Lake Michigan after a Monday afternoon discharge from the BP Whiting Refinery. Tarballs, or blobs of semi-solid oil, washed up along stretches of sandy and rocky shoreline that is owned by BP and inaccessible to the public. Coast Guard personnel drove back and forth along the southeast side of the refinery to haze the seagulls and keep them from landing in the oil-tainted beach. The discharge of crude oil was discovered at 4:30 p.m. Monday, BP spokesman Scott Dean said. The spill has been contained and is being cleaned up, while the U.S. Environmental Protection Agency reviews whether to fine the oil company or take any other enforcement action. "We did have a processing disruption last night at the Whiting Refinery," Dean said via phone from the scene Tuesday morning. "We immediately activated the response team." The spill presented no threat to human health or wildlife, said Mike Beslow, on-scene coordinator for the U.S. Environmental Protection Agency. There were no reported injuries. Dean said the discharge took place in "a little cove between the water treatment plant and the (ArcelorMittal Indiana Harbor) steel mill." "Some oil found its way into the cooling water system," Dean said. The oily water then was discharged into the cove leading to the lake, he said. The discharge did not last long. Beslow said the refinery was no longer discharging oil when he arrived about 9 p.m. Monday. BP officials informed him crude oil, which had not yet gone through the first stage of processing, had gotten into the No. 6 separator, which uses water from Lake Michigan to cool equipment. That water is supposed to go from a holding pond back into the lake, and was contaminated with crude oil before it was discharged through an outflow pipe, Beslow said. The equipment has a detection mechanism that immediately alerted refinery workers to the discharge. BP said in a statement that there had been no further discharge of oil. "Based on preliminary information, BP believes an upset at a crude distillation unit may have sent crude oil into the refinery's cooling water outfall and then into the lake. BP's investigation of the incident continues and the refinery has taken steps to prevent another discharge," the company said in a statement. "Meanwhile, response efforts continue. Lines of boom have been deployed to contain the oil and wind has blown oil toward the shore, where crews are vacuuming it out of the water and cleaning the limited quantities that have reached land between the refinery's wastewater treatment plant and a nearby steel mill." The company had not yet determined how much oil was discharged but expected to be able to provide an estimate as soon as Wednesday. Preliminary reports suggest as many as 10 to 12 barrels were discharged. A U.S. Coast Guard unit found an area of about 5,000 square feet covered in crude oil. BP deployed about 2,000 feet of boom and six vacuum trucks, and contained the spill to an area between the refinery and the Indiana Harbor steel mill. A U.S. Coast Guard helicopter and a BP plane flew over the lake, and observed no sheen outside of the boomed-off cove. Some of the crude oil washed up on sandy and rocky beaches at the refinery, which is fenced off. Coast Guard responders found an average of 20 tarballs, each less than 1 centimeter in diameter, per 10 feet of shoreline. The contaminated area stretched for about 2,700 feet, or about half a mile, along the shore, Beslow said. As of Tuesday, cleanup crews recovered 5,200 gallons of an oil-water mixture, which was mostly water, said federal on-scene coordinator Jeremy Thomas, who is a U.S. Coast Guard Marine science technician first class. They also recovered 10 square yards of oily debris, and oily booms and absorbent pads, he said. "We're working to minimize any impact to the environment," he said. "Conditions have been extremely helpful because the winds and waves have been pushing the oil to a natural collection point." Cleanup and containment efforts, which are under the supervision of the EPA and Coast Guard, were ongoing overnight and are expected to continue for at least another day or two. Dan Goldblatt, spokesman for the Indiana Department of Environmental Management, said crews at the scene about 2 a.m. Tuesday reported "a large sheen on the lake." Sheens on natural waterways are considered violations of the federal Clean Water Act. Dean said the sheen was no longer visible about 8:30 a.m. Tuesday. Lake Michigan is a source of drinking water to millions of people throughout the Chicago area, but the spill took place nowhere near any water utility intake pipes, said Charles Pietrucha, superintendent of the Hammond Water Works filtration plant. The Hammond utility, which provides water to 300,000 people throughout Northwest Indiana and Chicago's southeast suburbs, is monitoring water quality extra closely after the spill, though it was never close to contaminating the supply of drinking water. Hammond's two intake pipes are both a few miles northeast of the spill, and also are located at least 20 feet under the surface. "It was never a threat, but we will monitor somewhat more closely," Pietrucha said. "Due to where the intakes are and the wind direction, it was never even a threat." The oil did not pose any hazard to nearby Whihala Beach because it was small and contained before it got anywhere close, Lake County Parks CEO Bob Nickovich said. "My understanding is the company was very quick to respond, and it is pretty well contained," he said. Nicole Barker, executive director of Save the Dunes, said the spill has the Michigan City-based environmental group concerned about the impact of the spill on the environment, drinking water, recreational, fishing and shipping industries. 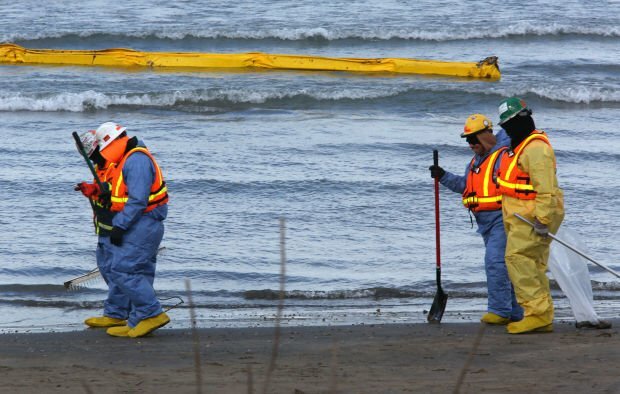 "This BP spill, while seemingly contained and currently under control exemplifies some of the concerns Save the Dunes has with transporting and refining oil near Lake Michigan," Barker said. "We are glad to see that the crews effectively responded to the spill and it is fortunate that winds were blowing in a way that pushed the oil toward the shoreline," Barker said. "However, irreversible damage can be caused by spills into our waterways and it is our greatest hope that the oil was contained before causing great harm to the Lake Michigan ecosystem." Production was never disrupted at the 413,000-barrel-per-day refinery, Dean said. Whiting's much-anticipated floating water park in Lake Michigan, the Whoa Zone at Whihala Beach, is slated to open June 24.